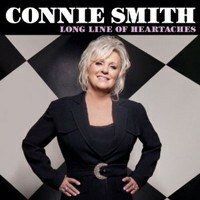 Connie Smith’s debut single “Once a Day” was a No. 1 country hit back in September 1964 and stayed there for eight weeks. Her career has had its ups and downs over the years, but legends such as George Jones, Dolly Parton, and Elvis Presley have sung Smith’s praises. Smith largely stopped recording in 1979, except for occasional sessions including a 1985 single written by Steve Earle, “A Far Cry From You”, and a comeback album co-written and co-produced by her fourth husband, Marty Stuart, in 1996. She’s been a cast member of “The Marty Stuart Show” since 2007, where her and her husband perform traditional country music. The good news is that Smith sounds very much the same today on her latest album as she did during her heyday back in the '60s. Her bluesy twang makes a torch song like “I’m Not Blue” (which she co-wrote with Stuart and Nashville legend Kostas Lazarides) smolder with pain and passion. The bad news is that times have changed while Smith has not. This gives the music of the 70-year-old Smith a time capsule quality rather than a lively engaging sensibility. Long Line of Heartaches sounds like an old Nashville record. The material is mostly cheatin’ songs: songs about wanting to be cheatin' or resisting cheatin’ or given in to cheatin’ and so on. There’s something weird about making such a record with your husband, but hey, they are both professionals. Cheatin’ songs and country music go together like love and marriage and divorce, and Smith does know all about this. She even has her three daughters sing harmony on the hymn “Take My Hand”, a song about human fallibility. Smith’s greatest strength is to sing the material straight, without the usual vocal embellishments that lesser crooners use to dress up their inability to phrase material in a forthright and honest manner. She just lays things on the line, whether she’s trying to reconnect with a lover after a relationship has fallen apart or merely acknowledging to another that it’s all over and there’s nothing one can do. Smith lets her annunciation of the key words carry the weight of the message. Even if one did not understand English, it would be easy to understand the difference when Smith seeks reconciliation from when she sings about breaking up, even though the emotional tone remains the same. The way she croons the lyrics make the feelings clear. As the title suggests, there are more songs about heartaches than joy. But Smith never seems down, just disappointed, at the failure of love to always thrive. Her “forever may not last”, but her faith in love goes on strong. This sentiment is common with male country crooners, but Smith’s attitude on searching for love with man after man is part of a persona she has had since the beginning. It was revolutionary back in the day and even now is somewhat shocking. But Smith makes her looking for a good man while always ending up with the wrong man seem conservative because she does not seem overly emotional or excited. So while Smith sings about being tired of heartaches, you know she’s going to give love another chance. And another. She hasn’t lived and loved so long without having a sense of what’s important in life.